Our Recommended Reading for Children & Young Adults and Recommended Reading for Adults articles have been popular resources for readers interested in Laura Ingalls Wilder and Little House on the Prairie. Here is a brief overview of The World of Little House. Laura Ingalls Wilder is the original pioneer girl, and her Little House books were inspired by the events of her life. This keepsake volume discusses how her real life was different from her stories, and it also focuses on her adult life and how she came to write the Little House series. In addition, it includes one chapter for each of Laura’s nine Little House books, exploring in detail the stories, houses, landscapes, journeys, foods, activities, and crafts. Maps, family trees, photographs, and a timeline trace the history of Laura and her family. Meticulously researched, lovingly written, and beautifully illustrated, The World of Little House is for anyone who has ever read and loved the Little House books. • A chapter each for Little House in the Big Woods, Farmer Boy, Little House on the Prairie, On the Banks of Plum Creek, By the Shores of Silver Lake, The Long Winter, Little Town on the Prairie, These Happy Golden Years, and The First Four Years. 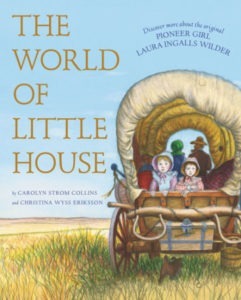 Carolyn Strom Collins and Christina Wyss Eriksson grew up reading the Little House books. Hoping to answer some of their questions about Laura and Little House, they visited every Little House site and museum and did in-depth research on Laura and her family. The result is The World of Little House. Both authors live with their families in the St. Paul-Minneapolis area of Minnesota, about a four-hour drive from where Laura lived in On the Banks of Plum Creek. In addition to writing The World of Little House, they are also the authors of My Little House Crafts Book, The Anne of Green Gables Treasury, and The Little Women Treasury. Garth Williams began his work on the pictures for the Little House books by meeting Laura Ingalls Wilder at her home in Missouri, after which he traveled to the sites of all the little houses. His charming art caused Laura to remark that she and her family “live again in these illustrations.” Garth Williams illustrated classic children’s books including Charlotte’s Web, Stuart Little, and almost one hundred other books. A fascinating interesting biography, Garth Williams, American Illustrator: A Life, was published by Beaufort Books in 2016. Deborah Maze is the illustrator of several picture books as well as a line of greeting cards. She is a lifelong reader of the Little House books and has fond memories of reading them to her children when they were young. She lives with her family in southern California. Pick up your own copy of The World of Little House here.